In the 1920's and '30's Hamilton made a few models in sterling silver in addition to gold or gold filled. One of the models was the 1933 Grant. This watch was made for only two years and was paired with another watch... the Lee. The gold filled model is much more common than the sterling silver model. 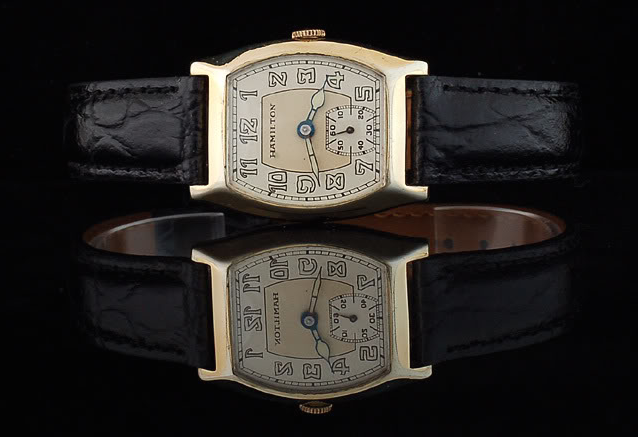 The Raised Gold Figure (RGF) dial is more common than luminous but both can often be found. The filled model typically shows wear through on the high points of the bezel in the corners. The RGF dial is textured almost like a wood grain. The watch is powered by the 6/0 sized 17 jewel 987 movement, typically a 987F. On the wrist, the Grant is a nice looking watch. It seems a little thicker than other models which may be why wear through on the bezel is so common. I think the figures on the luminous dial are really interesting. Photo courtesy of fellow Hamilton nut, Tom Diss. The watch you're describing does not sound like a Hamilton Grant. 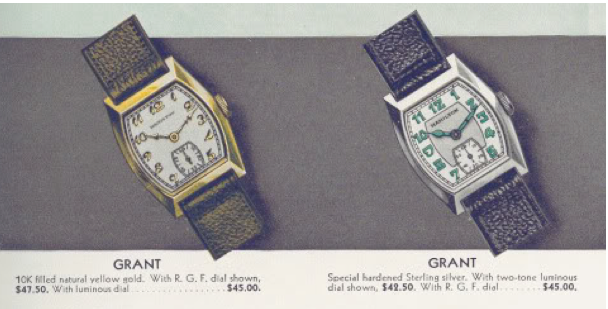 If you're describing a watch made by "Grant" then I don't have much info to share with you. Hamilton didn't use stainless steel case backs backs until the 1950s - with the exception of the Lexington from 1941 and the Vancott. 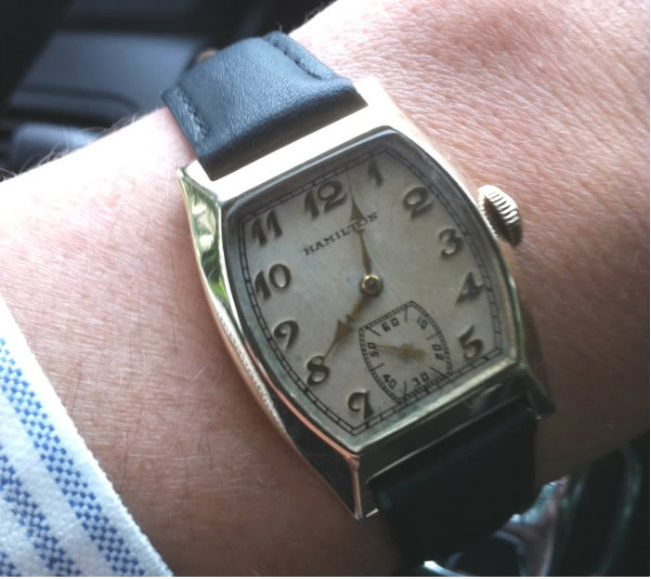 So any 1930's-looking "Hamilton" with a stainless back is likely not an authentic model. If you want to send me a photo or two, my email address can be found by clicking the "clicking here" above my photo in the upper right or by emailing me through my Etsy shop. The original dial blueprint specifies blue lume, does it not? Yup, it glows blue but is doesn't look blue otherwise.